The Court’s decisions are interpreted and disseminated via the media. During this process, the media paints an image of the Court and its business. Like any artist, the media has license regarding what to cover and the amount of attention devoted to any aspect of the Court and its business. Some cases receive tremendous attention, while others languish on the back pages or are ignored. These selection effects create a skewed picture of the Court and its work, and might affect public attitudes toward the Court. Indeed, studies of media coverage of other governmental institutions reveal that when, and how, their policy decisions are covered has implications for the public’s understanding of, compliance with, support for, and cynicism about the policy. This book uncovers and describes this coverage and compares it to the confirmation hearings, the Court’s actual work, even its members. Rorie Spill Solberg and Eric N. Waltenburg analyze media coverage of nominations and confirmation hearings, the justices’ "extra-curricular" activities and their retirements/deaths, and the Court’s opinions, and compare this coverage to analyses of confirmation transcripts and the Court’s full docket. 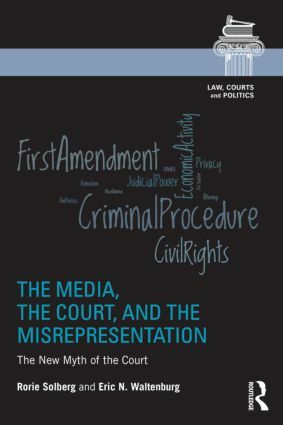 Solberg and Waltenburg contend that media now cover the Court and its personnel more similarly to its coverage of other political institutions. Journalists still regurgitate a mythology supported by the justices, a "cult of the robe," wherein unbiased and apolitical judges mechanically base their decisions upon the law and the Constitution. Furthermore, they argue the media also focus on the "cult of personality," wherein the media emphasize certain attributes of the justices and their work to match the public’s preferences for subject matter and content. The media’s portrayal, then, may undercut the Court’s legitimacy and its reservoir of good will. "Solberg (public policy, Oregon State) and Waltenburg (Purdue Univ.) examine media coverage of the US Supreme Court to ascertain the degree to which the old myth of the “cult of the robe,” which stresses judicial objectivity, competes with the new myth of the “cult of personality.” Using complex analyses of media coverage in leading outlets, the authors find that they increasingly stress personal and political differences among justices. … The authors fear that media emphasis on judicial personalities could undermine belief in the justices’ fairness but cannot prove that it has yet done so. More importantly, they do not report whether scholars, who long ago exploded the cult of the robe, have done better than the media in focusing on judicial reasoning rather than personalities or politics." Rorie Spill Solberg is an associate professor in the School of Public Policy at Oregon State University. She is widely published in journals such as Political Research Quarterly, Social Science Quarterly, Policy Studies Quarterly, and the Journal of Empirical Legal Studies. In 2011, she was selected to edit Judicature, the journal of the American Judicature Society. She received her PhD in American politics with a specialty in judicial politics from The Ohio State University in 1997. Eric N. Waltenburg is an Associate Professor of Political Science at Purdue University. His research interests concern judicial politics and state politics. He has published in such journals as American Politics Research, Political Behavior, and Social Science Quarterly, and he is the author or co-author of three books on judicial politics. He is a co-editor of Politics, Groups, and Identities, the official journal of the Western Political Science Association. He received his PhD from The Ohio State University in 1994 in American Politics, with a focus on Judicial Politics. In Democracy in America, Alexis de Tocqueville famously noted that "scarcely any political question arises in the United States that is not resolved, sooner or later, into a judicial question." The importance of courts in settling political questions in areas ranging from health care to immigration shows the continuing astuteness of de Tocqueville’s observation. To understand how courts resolve these important questions, empirical analyses of law, courts and judges, and the politics and policy influence of law and courts have never been more salient or more essential. Law, Courts and Politics was developed to analyze these critically important questions. This series presents empirically driven manuscripts in the broad field of judicial politics and public law by scholars in law and social science. It uses the most up to date scholarship and seeks an audience of students, academics, upper division undergraduate and graduate courses in law, political science and sociology as well as anyone interested in learning more about law, courts and politics.